French bread or a small baguette sliced sandwich-style, smeared with mayo–maybe a little mustard too, and filled with slices of milanesa, tomatoes, and lettuce. 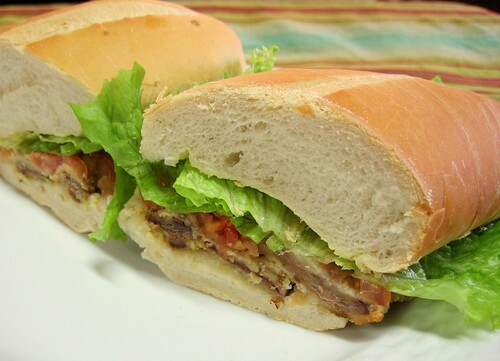 Although simple sounding, a sandwich de milanesa will obliterate any signs of hunger emitting from your belling. If you find yourself in Argentina yet, have no means to make one yourself, they can be found at many sporting events, supermarkets, rotiserías (take-out joints), or perhaps even a restaurant. If not, just use any wiener schnitzel recipe and construct this tasty sandwich until I do a post on proper milanesas in Argentina.